Three Bears General Store​ is one of the most popular spots to grab a souvenir when you visit the Smoky Mountains. This 40,000 square foot, unique shop is located in the foothills of the Great Smoky Mountains National Park and has everything you could ever dream of buying. Whether you want a stuffed animal, home decor, or a T-shirt, you will be able to find it here. What makes this stop on your trip so special though is its live bear habitat. You can see and feed live Smoky Mountain black bears! When you go shopping in Pigeon Forge TN at ​Country Barn Gift Shop​, you can find everything from licensed collectibles from your favorite movies and TV shows, to Minnetonka Moccasins for women! The store also has a fair amount of black bear souvenirs, from a black bear bath mat, to a black bear lamp. Customers love the wide variety of products that are sold here, so no matter what you&apos;re looking for, you&apos;ll be able to find it at Country Barn Gift Shop. 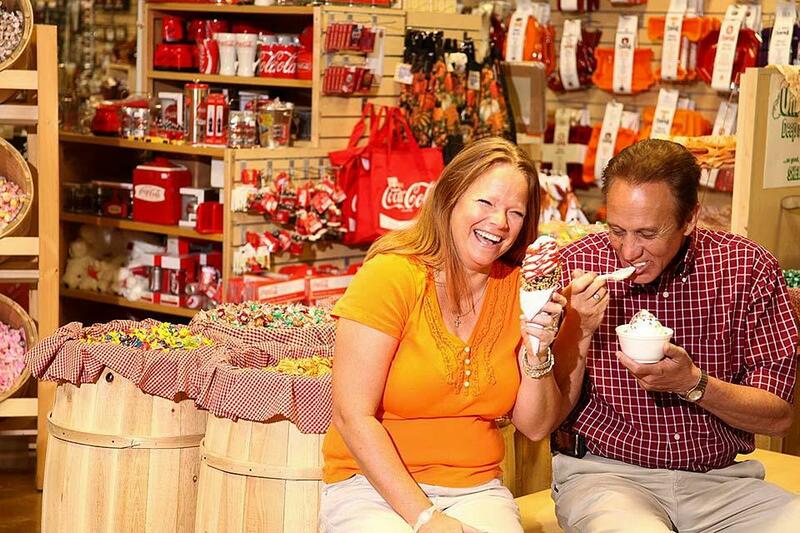 The Old Mill ​is one of the most popular places to visit when you&apos;re in Pigeon Forge. The historic mill is one of the most photographed mills in the entire country and is still functioning today. When you visit, be sure to spend some time browsing the products at ​The Old Mill General Store​. The store has a variety of products, like fresh-ground grains from The Old Mill, homemade jams and jellies, and more products from The Old Mill&apos;s signature line of foods. The store also has an abundance of Smoky Mountain memorabilia and gifts, so you can pick out a souvenir then enjoy an afternoon exploring all the shops in The Old Mill Square! Not only is ​The Island in Pigeon Forge​ an incredible place to go for entertainment and dining, it&apos;s great for shopping too! There are more than 35 retail and specialty shops, so you will have no trouble at all finding a Smoky Mountain souvenir. One of the best shops there is ​The Island Trading Post​, which has a fun-filled atmosphere that makes your experience at The Island complete. The store has a huge selection of unique gifts, including one-of-a-kind souvenirs, so if you&apos;re looking for something extraordinary, go shopping at The Island Trading Post! It&apos;s never too early for Christmas shopping! Get in the Christmas spirit any time of the year when you visit the ​Incredible Christmas Place​ in Pigeon Forge. Not only is it the South&apos;s largest Christmas shopping village, but it is your premier destination for Christmas gifts and collectibles! Get a Smoky Mountain ornament for your Christmas tree while you&apos;re there so you&apos;re reminded of your vacation each year! They have black bear ornaments, national park ornaments and even an ornament of the Pigeon Forge Trolley. You&apos;ll have plenty to choose from when you step inside this Christmas wonderland. Now that you know where to find the best souvenirs, it&apos;s time to start planning your trip! Browse more places for ​shopping in Pigeon Forge TN​ so you can find the perfect token of your Smoky Mountain vacation when you visit.